In this, the Silver Jubilee anniversary year of a special concert held over the Easter holiday to commemorate the life of the world’s greatest performer at a prestigious venue, I am reflecting on the occasion. At the Annual Brit Award Ceremony Brian and Roger stood on the stage of London Hammersmith Odeon, a stage where Queen had given amazing performances in the past, and invited everybody to London Wembley Stadium on Easter Monday! This was one concert not to be missed so plans were made immediately. I hired a coach to transport many Liverpool fans down to this hallowed ground, which I thought would be easier than driving in numerous cars or attempting public transport on a Bank Holiday. Other friends from outside the area jumped at the chance to travel on a coach. The biggest worry was tickets. Would we all be able to obtain one? They went on the sale the day after the Brits announcement and sold out within SIX hours! Queen Fan Club to the rescue. We all managed to purchase our tickets and now waited to hear who would be appearing. Speculation as to who would appear was rife within the Queenworld. News started filtering through when the band rehearsed at Nomis Studios by the end of March. David Bowie great, surely they will play Under Pressure? Extreme fantastic, Metallic, Robert Plant, ooh Freddie loved him. George Michael – what?? At least the guy can sing and another singer Freddie loved, Elton, Freddie’s friend, Seal, Lisa Stansfield and more. Roger and Brian called all their “friends” and most agreed to play. This was shaping up to be the ultimate show! How on earth though would these singers be able to sing the Queen songs a la Freddie Mercury? I thought this will be interesting. Bet they have to change the key they sing in. Freddie is a hard act to follow! I was asked if I could help out and make some Red Ribbons for this special event and I cajoled family, friends and neighbours to join me. We had Red Ribbon parties to help make many of the ribbons which were to be given away at the concert. This symbol would become the AIDS Awareness symbol and would be launched at the gig. With over a billion TV viewers around the world it would become recognisable. This built up excitement for the show. A trip to the Queen offices in London with bags of ribbons on hand was arranged and whilst there I collected the all important concert tickets. Then I had to collect money for the coach to pay the coach hire firm. All systems were go. The excitement grew and grew and Easter Monday on 20 April 1992 arrived quickly. Nine weeks after the announcement we were hitting the motorways heading to Wembley. There was a good atmosphere on the coach and we were treated to Queen videos and live concerts to help pass the time. The general chatter apart from still not believing Freddie was no longer with us but who would be the best of the day. Still many a bit negative on George though! Would a group like Erasure appear, Freddie loved them. We arrived at the stadium in good time and typical Scouse coach driver dropped us off right outside the entrance! We met up with loads of friends. I let my sister go off with mum to sit down and I joined friends on the pitch, this is where I wanted to be, I didn’t rush down to the front as I would have at a Queen show. This felt different. We all strolled in and found our spot in between stage and mixing desk. I thought about John Harris, then felt sad realising Freddie himself could be with him. I wondered if I was doing the right thing and being at the gig. I started to feel cold even though it was quite warm and the weather was good, this was a blessing being an outdoor concert. Emotions were strong for everyone. God knows how the band are feeling I thought. There was a scarf, red in colour like the ribbons available. I took along the very first Queen scarf I bought back in 1974. I knew what I’d be holding high above my head! My spirits lifted as the remaining surviving members of Queen walked on stage and there was a roar of approval from the crowd. Brian announced “Good evening Wembley and the World”. The Freddie Mercury Tribute Concert was about to begin. Roger and John also spoke, each receiving rapturous cheers from the Wembley crowd. What a tribute it was. There has never been anything like it, I doubt if there ever will. It was one of those occasions that you had to be there and would remember. Forever. The musical side of the show opened with Metallica Enter The Sandman, Extremes Gary Charone blasted out the opening of Mustapha which had the crowd singing along. Brian joined Def Leppard for Now I’m Here. The first half ended with Guns N Roses. Many celebrities adorned the stage and we fans were treated to David Bowie, Roger Daltrey, Def Leppard, Spike Edney, Extreme, Bob Geldof, Guns N Roses, Ian Hunter, Tony Iommi, Elton John, Annie Lennox, The London Gospel Community Choir, Josh Macrae, Mango Groove, Metallica, George Michael, Liza Minelli, Mike Moran, Robert Plant, Mick Ronson, Maggie Ryder, Seal, Spinal Tap, Lisa Stansfield, Miriam Stockley, Chris Thompson, U2, Paul Young and Zucchero. A surprise appearance too from Hollywood superstar Elizabeth Taylor! The crowd waited for Brian May, Roger Taylor and John Deacon to play and they opened their set with Tie Your Mother Down. Brian took lead vocals and was joined by Joe Elliot and Slash. Oh boy the tears started to flow again. Now this is personally my favourite live song by the band. There was someone missing from the stage. It hit home. Freddie’s gone! I kept thinking back to 1977 when this song opened the set. The hits were played and the crowd sang along in unison. This felt like a Queen concert even though it wasn’t! I often closed my eyes. Hearing the Red Special but not hearing THE voice I was used to hearing cut like a knife. The strangest part of the show was when Freddie was shown on the big screen. My whole body covered in goose bumps. It’s as if he was there but I couldn’t see him on the stage. The last time I was at Wembley back in 1986 he was in all his glory. Another surprise was David Bowie saying the Lord’s Prayer after performing Heroes. We all joined in. What would Freddie think of this? Seemed appropriate to me. The stadium was filled with emotion and joy as well, it was a concert after all, a celebration of life. ’39 destroyed me. Seeing George Michael standing where Freddie would was another emotional experience. Everyone singing along with Elton on Bo Rhap was yet another tear jerker. This show was becoming a roller coaster ride. Liza Minelli had me in tears from the moment she appeared. Freddie adored her and I think he would have been so proud to see her with his rock idols. One of my mates, who rarely cries looked up at the sky when Liza graced the stage and was singing We Are The Champions and up there was one bright star shining over the stadium. My mate said it was Freddie looking down on us. The water works flowed. It felt painful. 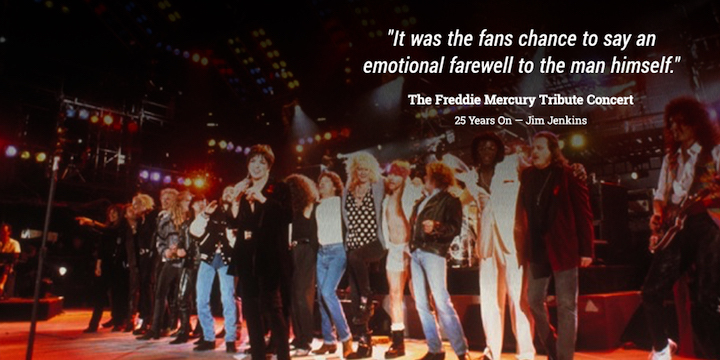 When all the performers joined for the finale and we realised the show had come to an end this was our final goodbye to Freddie. As he graced the screens for the traditional British National Anthem there wasn’t a dry eye in the house! Fireworks exploded to cheers from the crowd to mark the end of this very special day. The concert was a remarkable achievement. There were many highlights for me. Seeing James Hetfield singing Stone Cold Crazy, Roger Daltrey I Want It All, Seal performing Who Wants To Live Forever, Annie Lennox joining Mr Bowie for Under Pressure. Seeing Ian Hunter performing All The Young Dudes brought back memories for me of Queen with Mott The Hoople. Bowie played sax. Brian premiered Too Much Love Will Kill You, the crowd went silent to listen. The showstopper George Michael and Somebody To Love. It was the crowd singing with such passion along with Georges voice which made this the song of the show for me. I’m glad I went to the gig, show support to the one and only Freddie Mercury. The gang of us met up at the coach as we had been scattered inside the stadium. Everybody was buzzing about the gig. Who did we talk about coming home and who was the best? George Michael! We stopped at a service station and bought all the newspapers which we read on the last part of the journey home. Arrived home and started to watch the recording, luckily all there. It hadn’t cut out! Phew! There’s more on that video than the official release! Maybe it’s time to dig it out for the 25th anniversary. Monies raised from the tribute show was used for AIDS awareness and this continues to this very day. The Mercury Phoenix Trust help relief to those suffering from this dreadful disease. Freddie would be proud. Strange sitting here thinking Queen are still around and Freddie is larger than life even though he’s gone. He achieved what he wanted. He’s a legend. He had the biggest send off in history! The following year the FIVE LIVE EP was released and went to the top of the charts in UK. Freddie you will never ever be forgotten. Liza said at the end of the concert, looking up to the sky “thanks Freddie we just wanted to let you know we were thinking about you”. Twenty five years on proves we still are.